1) (co. Cambridge). Ar. an inescutcheon gu. over all a bend sa. 2) (co. Cornwall). Az. (another, gu.) three shovallers’ heads erased ar. (another, or). 3) (co. Cornwall). Az. (another, gu.) three shovallers’ heads erased ar. (another, or). 4) (co. Hereford, temp. Edward I.). Or, a fesse gu. in chief three martlets of the second. 5) (Melton Mowbray, co. Leicester, Cromwell and Beverley, co. York; John Lacy, son of William Lacy, of that place, who was living 1563, the grandson of Richard Lacy, of Halifax, co. York. Visit. Leicester, 1619). Ar. six pellets, three, two, and one. Crest—A fret-knot ar. and purp. 6) (Stamford, co. Lincoln). Ar. on a saltire engr. az. betw. four lions pass. gu. five bezants (another, the lions ramp. and four bezants). Crest—A demi lion ramp. gu. 7) (Stamford, co. Lincoln). Ar. on a saltire engr. az. betw. four lions pass. gu. five bezants (another, the lions ramp. and four bezants). Crest—A demi lion ramp. gu. 8) (London). Gu. two bends wavy erm. 9) (Longworth, co. Lancaster, 1664). Ar. six pellets, three, two, and one. 10) (Skipton-under-Whichwood, co. Oxford. Visit. Oxon, 1634). Gu. two bars wavy erm. Crest—Out of a ducal coronet or, a lion sejant erm. 11) (alias Hedges). (London, cos. Oxford and Wilts). Az. five swans’ necks erased ar. 12) (Enfield, co. Middlesex). Gu. two bars wavy erm. Crest—Out of a ducal coronet or, a lion sejant erm. 13) (cos. Northampton and Northumberland). Barry nebulée of six erm. and gu. 14) (Walsham-in-the-Willows, co. Norfolk, and co. Suffolk). Quarterly, ar. and sa. on a bend gu. three martlets or, over all a label of five points of the last, each charged with an erm. spot of the second. Crest—Out of a ducal coronet gu. a demi eagle, wings expanded or, in the beak an arrow of the first, headed and feathered ar. 15) (Beverley, co. York). Ar. a chev. betw. three bucks’ heads cabossed sa. Crest—A buck’s head cabossed per pale ar. and or, the horns counterchanged. 16) (co. York). Or, a lion ramp. gu. a bordure of the first and second charged with eight bezants. 17) (Lane House, Feckenham, co. Worcester). Ar. on a bend gu. three martlets or, a bordure engr. sa. Crest—On a ducal coronet or, a demi lion ramp. ar. 18) Or, a lion ramp. gu. Crest—A lion’s face looking out of a bush ppr. 19) Or, three chev. gu. in chief two lions ramp. sa. 20) Ar. on a bend sa. three plates. 21) Ar. two bends erm. 22) Or, on a cross az. five cinquefoils pierced ar. 23) Ar. on a fesse gu. four pales wavy of the field betw. three leopards’ heads erased az. 24) Ar. a fesse and three martlets in chief gu. 25) Gu. a bordure ar. over all a bendlet sa. 26) Ar. a fesse betw. three crescents sa. 27) Ar. on a saltire engr. az. betw. four lions pass. guard. gu. five bezants. Crest—A demi lion ramp. gu. 28) Gu. a fesse erm. betw. three boars’ heads couped or. 29) Ar. nine pellets, three, three, and three. 30) (Lord of Meath and Earl of Ulster). See De Lacy. 31) (Ballingarry, co. Limerick; a branch of the great Anglo-Norman family of De Lacy). 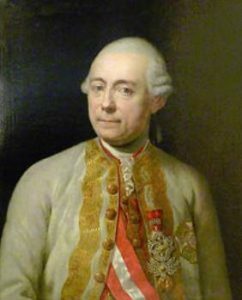 (allowed by Hawkins, Ulster, 1756, to Patrick De Lacy, Colonel in the service of the Emperor of Germany, descended from Lacy, of Ballingarry; this Patrick became afterwards Count of the Holy Roman Empire, President of the Aulic Council, and Field-Marshal). (Bruff and Rathcahill, co. Limerick; another branch of the Anglo-Norman family of De Lacy; to this branch belonged the Russian General Maurice de Lacy, of Grodno, and also Edmond Lacy, of Milltown, from whom descended, in the female line, the late British General Sir De Lacy Evans, G.C.B.). Or, a lion ramp. purp. armed and langued gu. Crest—An eagle rising or. Motto—Meritis augentur honores. 32) (Hartrow and Rowberrow, co. Somerset; William Lacy, of Hartrow, and Ezelius Lacy, of Rowberrow, temp. James I., sons of William Lacy, of Hartrow Viait. Soiner- aet, 1623). Gu. two bars wavy erm. This English/Irish last name is a locational name with Norman-French origins, meaning “de Laci”, a name given to a person who was from Laci, Normandy, France. One source claims the ancestors of this family were originally from Calvados, France and came to England with William the Conqueror during the Norman Conquest of 1066 AD. 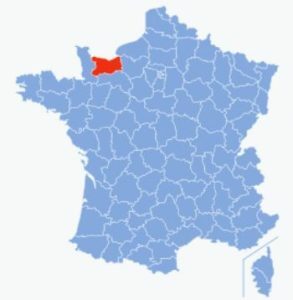 This town was mentioned in the Itineraire de la Normandie, spelled Lassi. It derives from a Lascius, a Gaulish personal (first) name of unknown origins. The family was prominent in Munster, Ireland, where they were granted lands by Strongbow (Richard Fitzgilbert de Clare) in the 12th century AD, after his invasion of the nation at the bequest of Diarmaid MacMurchada, King of Leinster who had fled Britain. In England, the name is found in Yorkshire and Ilbert de Lacy, son of Walter de Lacy (or Lacie) received the castle of Pontefract and over 100 lordships from William the Conqueror. Walter was sent to Wales to subjugate the principality and he acquired many possessions from his victory. Common spelling variants or names with similar etymologies include Lacey, Lace, Lassey, Lassy, Laci, Lascy, Layce, de Lacy, Lasey, Lacie, Laecey, and others. The Gaelic spelling is de Leis. It can also be an Anglicized version of O’Laitheasa or O’Flaithgheasa, which derives from the word flaith, meaning prince. The last name ranks Lacy ranks 1,467th in popularity in terms in the United Status as of the 2000 Census. The name ranks particularly high in the following five states: Alabama, Mississippi, Wyoming, Maryland, and Montana. The spelling variant Lacey ranks 1,855th and Lassey ranks 101,408th. The surname is even more common in England, where it ranks 630th. It ranks highest in the following counties: Buckinghamshire, Nottinghamshire, and Leicestershire. The name is common throughout the English speaking world: Scotland (1,428th), Wales (504th), Ireland (417th), Canada (2,041st), New Zealand (1,581st), Australia (768th), and South Africa (5,124th). The 1890 book Homes of Family Names by H.B. Guppy, states the following in regard to this surname: “Lacy was the name of an ancient and powerful ennobled family in the county; there was an old gentle family of Lacy at Melton Mowbray . The De Lacys were numerous in Lincolnshire in the 13th century, and the name also occurred then in the form of De Laci in Cambridgeshire, Oxfordshire, and Shropshire”. The name is particular common in Norringhamshire in England, and county Limerick in Ireland. The Domesday Book of 1086 AD, a survey of Wales and England ordered by William the Conqueror mentions a one Ilbert de Laci and one Roger de Laci. 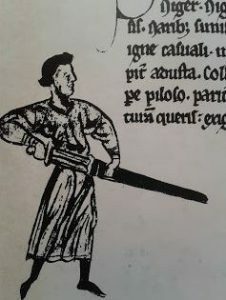 The Hundred Rolls of 1273 AD, a census of Wales and England, known in Latin as Rotuli Hundredorum lists two bearers of this surname: Gilbert de Lascy in county Salop and Walter de Laci in the same county. The Poll Tax of Yorkshire in 1379 AD lists two bearers of this last name: Robertus Lascy and Isabella Lassy. An early marriage involving this surname was Peter Lacue to Hester Shawe in London in 1571. The famous genealogist Bernard Burke’s book “Peerage and Knights” discusses this name. It begins with James Lacy of Garryrichard House, Enniscorthy, county Wexford. He had a son named John Pierce Lacy, who was born in 1839. In 1868, John married Mary Conick, with whom he had seven issue: William Xavier (1870), Sir Pierce Thomas, James Stanislaus (married Amy Walker), Joseph Aloysius (1876), Robert John Martin (1881), Mary Josephine (1936), and Elizabeth (married Daniel Caroll in 1907). Sir Pierce Thomas Lacy, 1st Baronet of Amtpon in Suffolk, was Justice of the Peace for Suffolk and was High Sheriff in 1927. 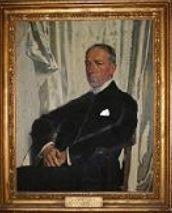 He was educated at St. George’s College Weybridge and was born in 1872. In 1898, he married Ethel Maud, daughter of James Finucane Draper of St. Heliers, Jersey” and had several issue with her: Lieutenant Maurice John Piece (served in World War II, married Primrose Roberts), Mary, Sybil Clare (died 1899), Cynthia Maud (born 1903, married Montague Waddington Oakes), Angela Florence (born 1905, married Lieutenant Colonel Godfrey Sturdy Incledon-Webber, Eveline Mary Elise (born 1908, married George Frederick Pinney in 1939), and Vivien Margaret (born 1911, married Lieutenant Colonel Nathaniel John Wilson). The Lacy coat of arms is blazoned as follows in heraldry: Gyronny or and gules, on a bend sable, a Lacy know between two martlets of the first. Crest: An eagle rising or, golden with a collar gemel gules, and resting the dexter claw on a Lacy knot sable. They were seated at Ampton Hall, Bury St. Edmunds, Suffolk. 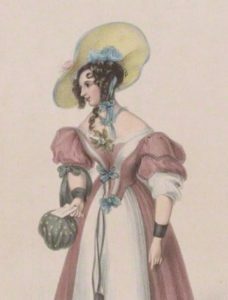 John married Allice Essex and had numerous issue with her, including Roger de Lacy. Roger was born in 1165 and he married Matilda Clare with whom he had three issue: Alice, John, and Roger. His son John was born in 1192 in Lincolnshire England and was Earl of Lincoln and Constable of Chester. He bore the following Lacy Coat of Arms or Lacy Family Crest: Or, a lion rampant, purpure. He married Alice Aigle and later Margaret Quincy and had three issue: Maud (de Clare), Idonea (de Dutton), and Edmund. His son Edmund Lacy was born in 1230 in Pontefract. He bore the following arms in heraldry: quarterly, or and gules, a bend sable over all a label of three points argent. He married Alasia Saluzzo and had two issue with her: Henry and Margaret (de Cantelowe). Henry was born in 1251 and he married twice: Margareet Longespee and Johanna Martin Audley. They had three issue, John, John, and Alice (le Strange). His second son John was born in 1278 and he in turn had a son named Robert. Robert was born in 1311 and was Lord Vice Chancellor of Chester. He had a son named Brian de Lacy who was born in 1350. He married Amicia Arcedeckne and had a son with her named John. John was born in 1370 and he married Ellen Cromwelbotham. They had a son named John. This John was born in 1395 in Brombleton, West Riding and had three issue with her. A one John Lacy was born in 1561 Cromwellbotham, assumedly several generations down from the previously mentioned John. He had a son named Thomas who was born in 1858 in Horton, England. He had a son named Thomas Lacy I who was born in 1620 in Westminister. Thomas I had a son named Thomas who was born in 1649 in St. Margaret, London. He moved to Virginia, and had a son named Thomas. This Thomas was born in 1660 in England, and he married Phoebe Rhuys, and had a son with her named Thomas II. Thomas II was born in 1684 in Virginia. He married Ann Burnley and had the following children: Thomas, Stephen, Thomas IV, William, Nathaniel, Phoebe (Godsey), Elkanah, and Elliott. Thomas Lacy IV was born in 1708 in New Kent IV. He married Sarah Rice and had two issue with her: Susannah (Evans) and Thomas V. Thomas V was born in 1729 in Halifax, VA and he had a son name Matthew. Matthew Lacy was born in 1758 and married a woman named Terry, wand had a daughter named Susan Elizabeth, born in 1782, who married Thomas Roberts. The family of de Lacy is of Norman origin, as they came with William the Conqueror during his conquest, and they soon became Earls of Lincoln in England. One of the most prominent Anglo-Norman invaders or nobles was Hugh de Lacy (about 1020-1085 AD), who went into Ireland with King Henry II, landing at Waterford in October of 1171 AD. 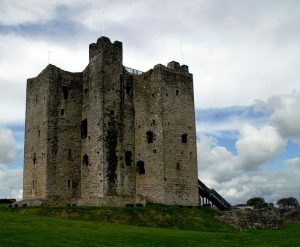 The King granted him the Kingdom of Meath, which was ruled by King Murchard O’McLaughlin, and he drove out the previous ownters and erected numerous castles there, including Kells, Trim, Durrow, and Ardnorcher. He was appointed Lord Deputy on two occasions and he married a daughter of Roderic O’Connor, the King of Connaght. He died in 1186, he was assassinated by a man named O’Meyey, who cut off his head with a battle axe, which was instigated by O’Carnaby, whose lands were despoiled by Hugh de Lacy. Hugh had two sons with his first wife: Walter, Lord of Meath, and High, who received his father’s lands and afterwards appointed Lord Deputy and Earl of Ulster. Neither left male heirs, but he also had a son named William with his second wife. This William was the ancestor of three branches of the family that were seated in Brurce, Bruff, and Ballingarry in Limerrick. Many notables are members of this family, including Pierce Oge Lacy, a famous revel who was the eighteenth in descent from William. One celebrated member was Field Marshal Peter Lacy of the Russian military. He was born in Killedy in 1678 and at the age of only 13 years old, was an ensign in Sarsfield’s army in an infantry regiment, of which his uncle, John Lacy, was the quartermaster-general and brigadier, was colonel. The book General of Irish Families, by John Rooney, published in 1895, states the following regarding this man: “Accompanying the army to France, he was appointed lieutenant in the Regiment of Athlone, Irish Brigade. Having served with Marshal Catinet’s army in Italy, and after the peace of Ryswick, owing to the reduction of the Irish Jacobite force in France, he entered the service of Peter the Great of Russia in 1700. In December, 1708, the distinguished himself while in command of 15,000 men at the assault of Rumna, held by the famous Charles the Twelfth of Sweden. At the great battle of Pultowa, in 1709, where the power of Sweden was irretrievably broken, Lacy commanded a brigade and materially contributed to that important victory”. 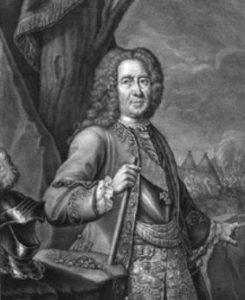 In 17211 and 22, he was a lieutenant general who commanded several expeditions on the coast of Sweden that were successful. He was later appointed governor of Livonia (a historica reigion by the Balric Sea inhabited by Baltic and Finnic people ruled at times by Sweden and Poland )and fought the Turks during the Crimean conflict. He later went to war again against Sweden in 1741 and had a victory at Delsingfors, and won a piece of Finland for the Russian Empire. Other members of this family achieved military honors in the service of the Spanish crown. The book Genealogical Guide to the Early Settlers, mentions two people bearing this surname: 1) Lawrence Lacy, Andover, who had children named Lawrence (1683) and Abbot and 2) Morgan Lacy of Sacco in 1660. A one William Lacy, age 18, came to Virginia in June 1635 aboard the Thomas & John. A one Robert Lacie came to St. Christopher (island in the Caribbean) in May 1635 aboard the Mathew. Other settlers in early colonial America with this last name include Richard (Virginia 1635), Win (Virginia 1635), Eliza (Virginia 1649), James (Virginia 1653), Mary (Virginia 1717), Prissela (Virginia 1719), and John (Virginia 1723). Some of the earliest settlers in Canada bearing this name include James Lacy and William Lacy, who came in 1784, to Belle Vue and Catelton, respectively. They were United Empire Loyalists, people who did not support the cause of American independence from the British crown, and were often driven out of the country. Three members of the Lacy family, Robert, Edward, and Emma came to Wellington, New Zealand aboard the Golden Sea in 1874. One of the earliest settlers in Australia bearing the name was Bernard Lacy, a weaver by trade, who came in the early 1800s and settled in New South Wales. The Lacy family motto is Meritis augentur honores, which means “Honours are enhanced by deserts”. There are thousands of notable people with the Lacy surname. This page will mention a handful. 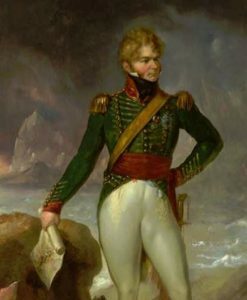 Famous people with this last name include: 1) Franz Moritz Graf von Lacy (1725-1801) who was a famous Austrian field marshal and friend of Holy Roman Emperor Joseph II, 2) Harriette Deborah Lacy (1807-1874) who was an English actress from London, 3) William Lacy (died 1683) who was an English Catholic priest and martyr from Yorkshire, 4) William Henry Lacy (1858-1925) who was an American Methodist who was a missionary to the China from Milwaukee, 5) Suzanne Lacy (1945) who was an American artist and writer from Wasco, California, and 6) Steve Lacy (1934-2004) who was a jazz saxophone player and composer from New York City who was known for Dixieland music. The two main symbols in the Lacy Family Crest are the shovallers/duck and the pellet. We can consider the goose and duck together here as the former is quite rare, the latter appear in several forms, but both share the same meaning. Guillim, the 17th century author points out that such birds can swim, fly and run and thus their use may symbolise those who “have many ways of eluding their enemies”. Other names for the ducks especially mayh have been used because of some assocation with the family name, the smew may fall into this category. For easy recognition of the items on a coat of arms, and hence the quick identification of the owner, bold simple shapes are best. Hence, simple geometric shapes are often used for this purpose. One of the simplest such shapes is the plain circle, known to heralds as the roundle. So popular is this charge that a shorthand has arisen for roundles of a particular colour and pellet is a roundle sable, or black. It is also known as an ogress or gunstone. Most authorities agree that the English usage signifies the “Manchet cake” or communion wafer and thus is a symbol of religious allegiance.